Northern shovelers are beautiful in any light, but especially when you catch the right reflection off of their iridescent feathers. The right mix of overcast light and head angle really helped to show off the colors of this drake. Oh that's lovely! Not often you get that perfect light! And yet another amazing photo. I just had to Google Radio Road Ponds, having never heard of them before. Redwood City. I am not fond of going down into the Bay Area, preferring to stay in my North Bay backyard, but I may just have to take a day and check this place out. Fabulous colors on this guy, Pat. Wonderful shot! 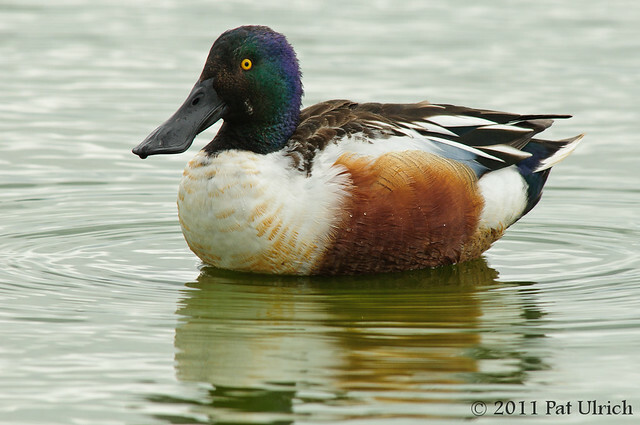 That's a gorgeous close-up of the shoveler, Pat! A perfect shot of this stunning bird! Thanks, Sinbad! You should definitely stop there next time you have a reason to be in the Bay Area. There are birds there year round, but the best time in my opinion is the winter when the ducks are abundant!